They are giving real time information! I am sure that many people have seen this but I just wanted to keep a note of it as its such a good example. 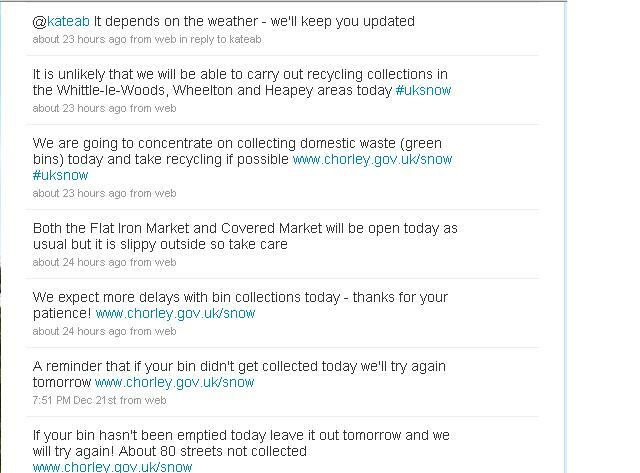 I thought of doing this as a compare/contrast piece as there are a lot of council’s using twitter to put out press releases etc which I don’t think is nearly as effective as what Chorley are doing – and I started to get fairly judgemetal about the fact. 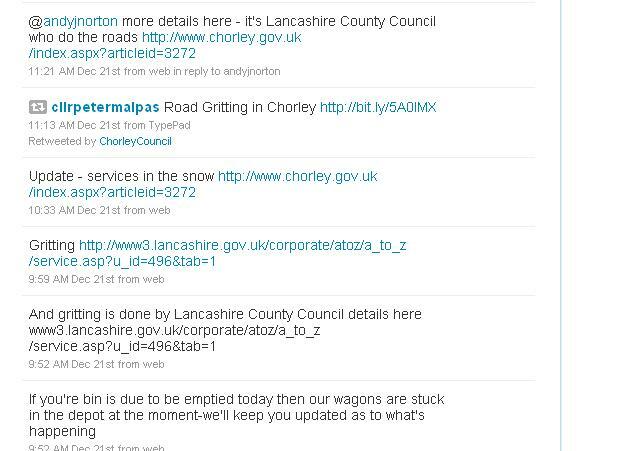 However given that far more council’s are not using it at all I think anyone who is giving this a go needs to be thanked – and I think its better to note the best practice and hope we can learn from it – must be the Christmas spirit!! This is a little dangerous as it means that you treat twitter like digital ephemera – but its not – its part of your digital footprint. Are people not thinking about this or are they taking a ‘secuirty through obscruity’ tack on this? Given how little people think about digital identity generally perhaps its the latter. I know I am dull on the subject but twitter is made for real-time web which means an iPhone (or the like) would really help here…. It can have a huge effect on blog readership – I have been tweeting new blog posts and there is a clear correlation in terms of readership. No real sense as yet as to what makes this happen more or less – am currently just grateful that it happens at all! Will revisit this as a 100 tweet celebration to see if anything has changed….